Ovulation is the complex process by which the follicle-enclosed oocyte is released from the ovary for transfer to the oviduct where it can be fertilized. To prepare for ovulation, the ovary undergoes a series of closely regulated events that are controlled by hormones, growth factors, and intrafollicular regulatory molecules. Small follicles must mature to the preovulatory stage during which time the oocyte, granulosa cells, and theca cells acquire specific functional characteristics. The oocyte becomes competent to undergo meiosis. Granulosa cells acquire the ability to produce estrogens and respond to luteinizing hormone (LH) via the LH receptor. Theca cells begin to synthesize increasing amounts of androgens that serve as substrates for the aromatase enzyme in the granulosa cells (for review, Eppig 1991; Richards 1994). Remarkably, many events are spatially restricted to specific microenvironments within the follicle or surrounding interstitial compartments to allow successful expulsion of the cumulus-oocyte complex (COC) from the ruptured follicle (Hess et al. 1999; Hizaki et al. 1999; Sato et al. 2001; Zhou et al. 2001) (Fig. 1). Failure of any one of these events prevents ovulation. Ooocytes become entrapped in follicles or corpora lutea and eventually degenerate. In essence, ovulation is a unique biological event that is obligatory for reproductive success of all species. Our understanding of this process is critical for designing better ways to improve and regulate fertility. 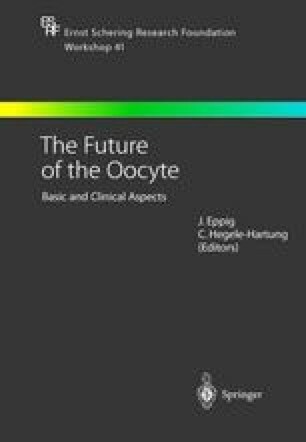 This text describes some recent results that document the specific roles of the granulosa cells in directing successful rupture of the follicle as well as the cumulus cells in synthesizing a matrix obligatory for the release of the oocyte from the follicle and its transport into the oviduct.